My Simple Obsession: What Would You Do? Guess what I saw while searching the web today! A chandelier that looks almost like the one I had made! Crazy price though! So there is mine! 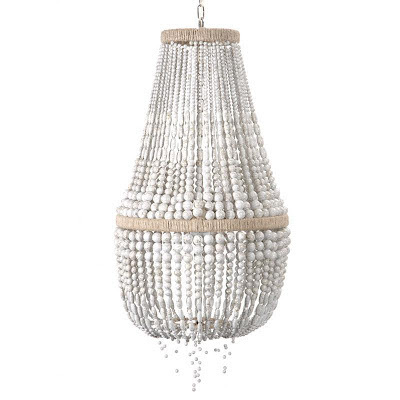 But check out this $4,200.00 Ro Sham Beaux Malibu Up Chandelier! I think I like mine better, but I love how they used different style of beads. What do you guys think? Would you spend 4 G's on a chandelier? Or just make one yourself using my tutorial for not even 5% of that cost! It actually cost less than that. rounding around 2.5% of that cost! Get creative! Until next time keep creating, living, and obsessing!